The following characters appear in the Sarnian series. Click their names to open a full biography for each character (which may include some details that are revealed within the storyline contained in the book, so read at your own peril). The bio snapshot to the right of each name should be enough to jog your memory and position each character within the world of The Sarnian. 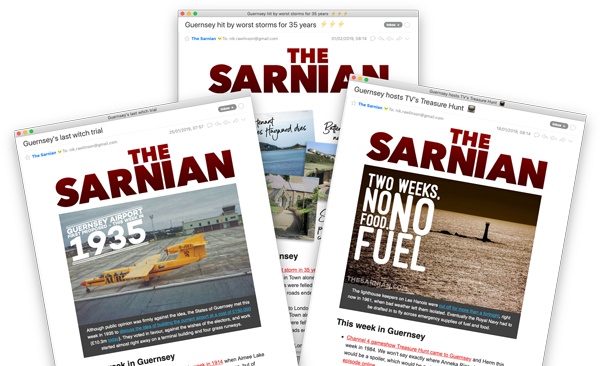 Alternatively, if you need to know more about the structure of The Sarnian team, click here for a PDF organisation chart (opens in a new tab / window). Renouf, SophieNurse; wife of Marc Renouf. Clicking a character's name opens their full profile, which may include details from events that happen in some of the stories. Beware that these details could constitute spoilers. For this reason, a short spoiler-free description has been added beside each character name in the listing on this page.